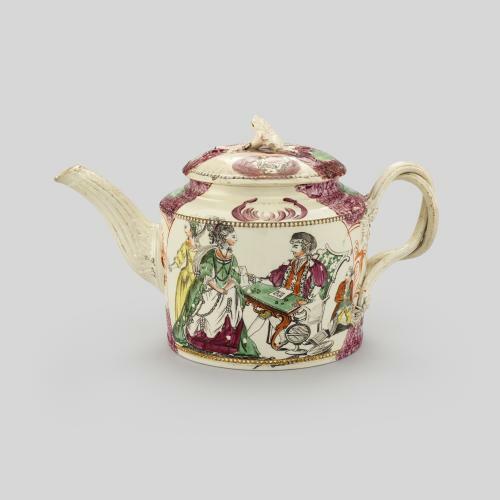 During the 18th century, the rising popularity of Staffordshire pottery led to the creation of new decorative techniques to manufacture tea and table wares. 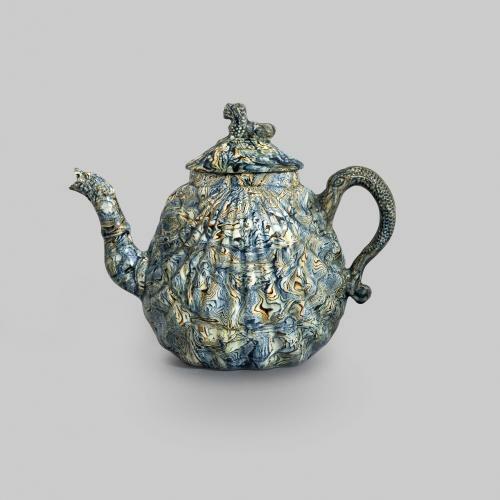 Agateware pottery, from which this teapot is made, imitated the swirling patterns of agate, a semi-precious stone that was prized during this period. The effect of agate was created by using sheets of different coloured clay that were stacked, cut, rolled and then reformed to create a swirling multi-coloured pattern. The sheets of clay were pushed into two half-teapot moulds that were then joined together. During the mid-18th century, novelty Staffordshire teapots took many forms and this ‘pectin’ shell shape was one of the most popular. The shape was also made in earthenware and salt-glazed stoneware. The teapot finial takes the form of a Chinese lion, reflecting the ongoing fashion for East-Asian inspired motifs in the decoration of teawares. The production of agateware was a costly and lengthy process, and by ca. 1760 the technique had become obsolete.